The type of icon display and the Desktop background that you choose affect how quickly your screen updates in the Finder. You can set and change these choices in the View Options window. From the Finder, choose View→Show View Options (or use the keyboard shortcut Command+J). The View Options window, like your old friend the contextual menu, is . . . well, contextual: Depending on what’s active when you choose it from the View menu, you see one of five similar versions. Clockwise from upper-left, the figure shows the options for the active window (Applications) in Icon view, List view, Column view, Cover Flow view, and the view options for the Desktop. Icon Size: The smaller the icon, the faster the screen updates, especially if the folder has many graphic files with thumbnails (those little icon pictures that represent the big picture the file contains). In the Icon view of the View Options window, moving the Icon Size slider to the left makes icons smaller and faster; moving it to the right makes them bigger and slower. 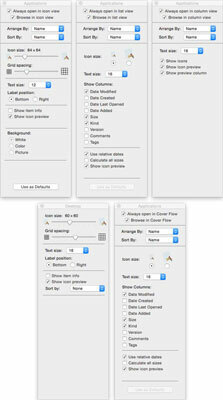 In List view, select one of the two Icon Size radio buttons to choose smaller (faster) or larger (slower) icons. The difference is greater if you have a slower Mac. Calculate All Sizes: If windows in List view take a little while to populate after you open them, try deselecting the Calculate All Sizes check box in the View Options window for List view. If you activate this option, the Finder calculates the size of every folder of every open window in List view and displays that number in the Size column. The screen feels as though it redraws faster with this feature turned off. If you want to know how big a folder is, you can always just click it and choose File→Get Info (or use the keyboard shortcut, Command+I). Show Columns: When it comes to speed, don’t worry about the Show Columns check boxes in the View Options window for List view — Date Modified, Date Created, Size, Kind, Version, and Comments. The effect of these items on screen updating is pretty small these days, so your choice should probably be made according to the specific information you want to see in Finder windows, not on whether choosing them slows down your Mac. The Use as Defaults buttons at the bottom of the Icon, List, and Cover Flow View Options windows set the default appearance for all Finder windows of that type. If you don’t click the Use as Defaults button, any changes you make apply only to the active window. Note that Column view windows and the Desktop don’t have a Use as Defaults button; in both cases, any changes you make automatically become the defaults.